Agriculture plays an important role in the economy of the WV Bay Counties. In the Potomac Valley, the poultry industry ranks as West Virginia's number one agricultural industry. Beef cattle and corn for silage and grasslands are other important agricultural commodities in both the Potomac Valley and the Eastern Panhandle. According to the Chesapeake Bay Watershed Model (CBWM), the agriculture sector is responsible for forty-nine percent of the total delivered nitrogen load and sixty-two percent of the total delivered phosphorus load to the Chesapeake Bay. West Virginia's farmers have a proven history of being good stewards of the land. Over the past several years an impressive, voluntary, incentive based, agriculture nutrient and sediment reduction program has unfolded in West Virginia and significant progress has been made. The State is also committed to working with universities, other researchers and agricultural experts to strengthen the science of BMP implementation and effectiveness as it relates specifically to West Virginia. There many resources available to agricultural producers within the drainage to continue to protect local and downstream water quality. Listed below are just a few examples of Best Management Practices (BMPs) that can be implemented at the farm level to make a big impact on production costs and water quality. The key principle behind Nutrient Management planning is to balance soil nutrient inputs with crop requirements. 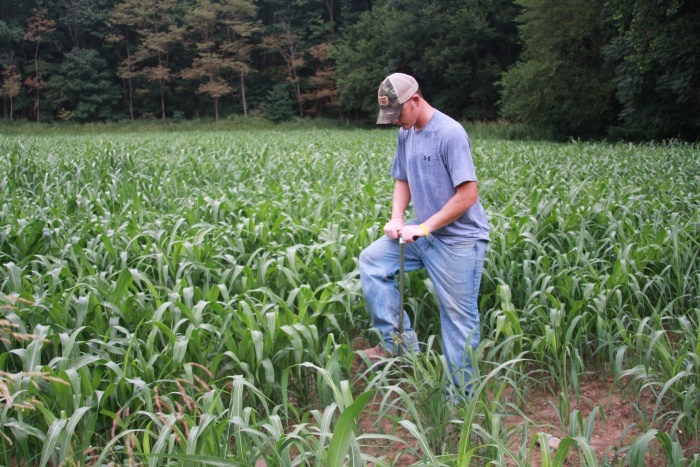 Both farm profitability and water quality can be improved through efficient nutrient use. Contact the West Virginia Department of Agriculture in Moorefield, WV at 304.538.2397 for technical assistance and free voluntary plan development. Cover crops are grasses, legumes or small grains grown between regular grain crop production periods for the purpose of protecting and improving the soil. Streambank fencing is a means to improve water quality by establishing a vegetative buffer that captures nutrients before they enter a stream and prevents soil erosion. Animals that are allowed access to streams can cause a great deal of erosion along the streambanks. The animals can also stir up a great deal of mud in the stream and add nutrients to the water that cause environmental concerns. surface runoff and reduce nutrients and other pollutants in shallow subsurface water flow.